Welcome to the 7th Issue of the LOA Haven Ezine. The Law of Attraction Haven brings you the latest addition to our Free PDF Books - Brotherhood by Joseph Benner. You will see this book arrive on our Free PDF Books page on September 30, 2017. This is a little later than usual because I'm going to Europe for a holiday (or a vacation as my U.S. friends call it!). Joseph Benner published Brotherhood and all his books under the pen name "anonymous," believing that his books were inspired by the God within. Elvis Presley was said to be Benner's biggest fan. You can read more about that here. Benner encourages us to seek the kingdom within rather than trying to find happiness, wealth, health or any good thing on the outside. If you have come across this book, Benner tells you that it is your purpose to understand the work and demonstrate its teaching to others, so that you can assist them in reaching for a higher state of being. He shares the way to tell the difference between your own calm, knowing, strong, inner voice and the noise from the outside world. He believes that by opening our heart to others we will in turn feel greater love and attract people into our lives with whom we can share joy far beyond what we have ever imagined. The work centers around leaving the self behind, seeking only to serve humankind - bringing the gifts of heaven here to earth. It is a tiny book that has a mighty impact. You will find more free books by Joseph Benner on our Free Books page. Alternatively, Benner's other works are individually listed below for your convenience. Here is my version of a beautiful prayer from Joseph Benner's book The Way to the Kingdom. You'll find the original version in the Appendix of The Way to the Kingdom. Dear universe, hear my earnest prayer. Draw me in consciousness deep within where self exists not, and where I may be one with your infinite power. Help me to open my heart wide and let out enormous love, that it may possess me utterly, may rule, motivate and inspire my every thought, word and act, merging me completely into love, enabling me to love as you love, to see as you see, to hear as you hear. Lift the consciousness of my human mind into complete oneness with universal consciousness; so that I can consciously, at will, be with you, work with you, commune with you at all times and on all planes, when the need is in your service. And may I know with your understanding all things I seek and need to know. Cleanse me of all consciousness of self and of separation from you, so that you may live in me, do your will in me, be yourself in me, without hindrance of any kind, for evermore. Dear universe, make me abide always in your consciousness, and your word to abide in me, giving me always your wisdom to light and direct my way; your will to strengthen and sustain me; and your love to surround, protect and fill me; so that I may see you, may feel you, may know you, may be truly one with you, everywhere, in everything, and in everyone. I thank you, dear universe, for your many blessings. Take me within, so that I may be a selfless and perfect instrument for your use. 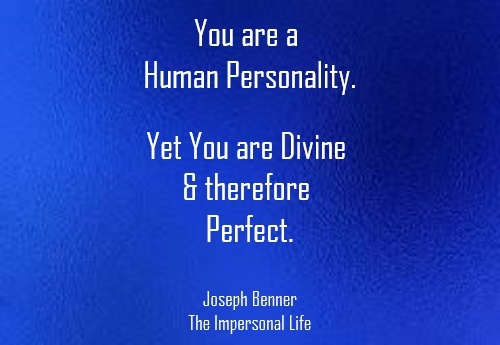 Joseph Benner's quote below is an absolute reflection of the message he conveys in his books. Learn how to pay attention to your inner world by Awakening Your Intuition. This audio download will help you to develop powerful intuition and to trust your instincts, looking within, rather than to the outside world, for the answers you seek. Many great authors including Dr Joseph Murphy and Neville Goddard believe that by accessing your subconscious mind, you are communing with God. - Be more open to patterns in life. - Become more aware of your own intuitive voice. - Use your intuition to make better decisions and predictions. As at the time of this newsletter 'Develop Powerful Intuition' has been purchased by 1056 customers. The above information on Awakening Your Intuition is courtesy of Hypnosis Downloads. I hope you have enjoyed this latest book by Joseph Benner. Click here for more free books by Joseph Benner. I'm off to Europe for a break so there won't be a new book in September. I'll see you again in October for another free book.